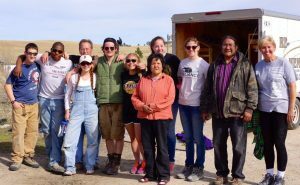 Six Middlebury students, funded by a CE Cross-Cultural Community Service (CCCS) grant, spent their spring break in South Dakota on the Pine Ridge Reservation. 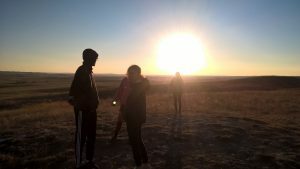 When this group of students met at the Architecture Table on campus, they did not at first imagine that they would end up traveling together to South Dakota to learn from the Lakota community and to work with the organization Re-Member. Re-Member is dedicated to raising the quality of life of Native Americans on Pine Ridge. 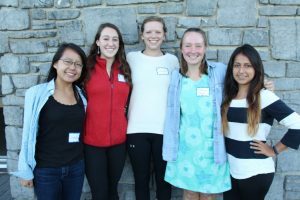 Two students, Maggie Cochrane ’16 and Nicole Cheng ’17, reflect on the experience below. This opportunity was funded by a CCCS grant. Learn more about CCCS here, and about other Community Engagement funding resources here. 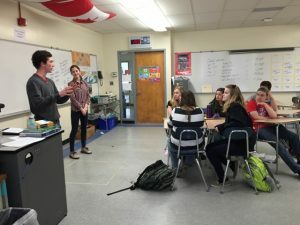 This entry was posted in Midd Blogosphere and tagged Student Stories, Uncategorized on May 13, 2016 by Alison Haas. 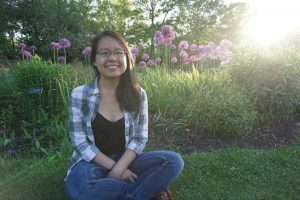 Middlebury College students Kristina Frye ’17 and Elizabeth Zhou ’18 may share an equal enthusiasm for reading, but by no means do they love it for the same reasons. Upon sitting down with Frye and Zhou to discuss the student organization, Page One Literacy, it was impossible at first to see how the two served as complementary, yet opposing, points of reference for the organization, exemplifying the broad spectrum of those who love to read, effectively, yet perhaps unknowingly, playing yin to the other’s yang. Frye and Zhou, President and Programs Coordinator, respectively, work together along with an average of 25-30 other students each semester to support and further the aims of Page One Literacy. Through semester-long after-school reading programs and one-time events open to the community, Page One Literacy strives to promote literacy and foster a love of reading among local children in the Addison County community. 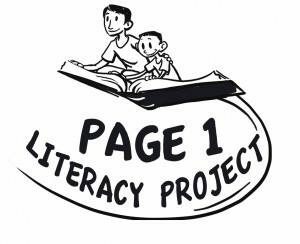 This year marks Page One Literacy’s 15th anniversary, providing an apt moment for the organization’s leadership to take stock of its successes as well as envision their future. Frye and Zhou first met in the Russian Deparment at Middlebury, but it was through Page One Literacy that they have gotten to know each other better. Their contrasting motivations and distinct personalities are a testament to Page One Literacy’s inclusivity, but more than that, demonstrate that reading is not reserved for one type of person only. Zhou got involved in the program her freshman spring, seeking out a reading program in large part due to the impact that it had on her as a child. Zhou describes herself as a quiet kid who kept to herself and who preferred reading in a nook to running around with others. Reading gave Zhou another world into which she could escape and exposed her to characters with identities different from her own. In fact, it was through reading that she started to become more comfortable with her own introversion. Some of her favorite childhood books like the Berenstein Bears inspired adventure, while Shel Silverstein’s poems, according to Zhou, encourage you to “be yourself”. For Frye, on the other hand, reading has always been a social activity. Her fondest memories as a child include reading stories with her dad and sister before bedtime. Today, as a volunteer with Page One Literacy, Frye remarks that she has loved getting to know her co-volunteers and one of her favorite aspects of the program is its ability to connect people to each other. A typical after-school session involves an introduction and a moment to “get the after-school jitters out”, reading in pairs or groups, individual silent reading, and a reading-related craft activity. Along with the problem of transporting college volunteer to the schools, Frye noted that the wide range of reading levels poses a challenge to volunteers. What to do when one child is reading at a fifth-grade level and others have only just begun reading weeks earlier? And what to do with a group of children coming into an after-school program with vastly different strengths, weaknesses, and life experiences? Volunteers are trained to be as flexible as possible and come to the program with a large repertoire of activities. Zhou cited one of her victories from last year when she unconventionally paired students of different reading levels together, due to an asymmetrical variety in the group. 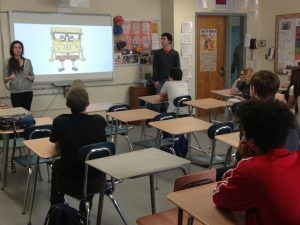 To her surprise, the kids responded positively. “You learn to follow their cues,” Zhou says of the kids. This year the program has grown. 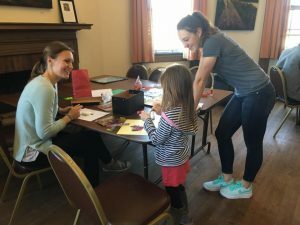 While the difference of five volunteers may not seem like much, in fact, with the growth from 25 volunteers last spring to 30 volunteers this spring, Page One Literacy has been able to expand to 9 sites and 12 programs. Five more volunteers translates to a few extra after-school programs, extending programming to a few dozen more children. A critical sign of growth, Page One has also witnessed a shift in its relationships with other organizations and community partners, who have started to reach out to Page One with events instead of the other way around. 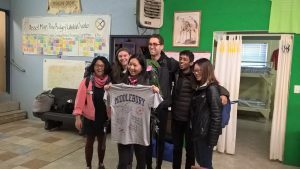 As far as goals for the future, Zhou included an investigation into the disparity of male-female volunteers with the aim of ultimately attracting more male volunteers to the program to serve as mentors and role models. Frye discussed retaining volunteers over multiple semesters and creating greater awareness on campus, as through the newly up-and-running Page One Facebook page. Whatever the future holds, Page One Literacy is in good hands. Learn more about Page One Literacy at the website, on Facebook, or by reaching out to pageone@middlebury.edu. This entry was posted in Midd Blogosphere and tagged Uncategorized on April 25, 2016 by Alison Haas. Since 1973, the Academy of Nutrition and Dietics has celebrated nutrition every March, encouraging Americans to learn more about the food they put in their bodies and to develop healthy eating habits through the National Nutrition Month campaign. “Savor the Flavor of Eating Right” is this year’s National Nutrition Month theme. “Savor the Flavor of Eating Right” promotes mindful eating behaviors that strike a balance between nutrition and pleasure. After all, eating is just as much about nourishing our bodies as it is about enjoying food traditions, social interaction, and flavors. Although it’s still winter here in Vermont, there are plenty of nutritious and flavorful local foods available through cold storage and other methods. Think: root veggies, winter squash, carrots, and cabbage. However, many residents of Addison County struggle to gain access to fresh, healthy foods. 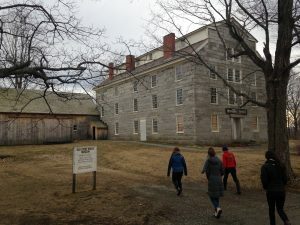 Organizations like HOPE, the Vermont Foodbank, and others work to expand access through food shelf services and initiatives such as Gleaning, VeggieVanGo, and more. Nutrition Outreach and Mentoring (NOM), a student organization on campus engages and educates local children and families around issues of nutrition, working towards the mission of National Nutrition Month year-round. Chelsea Colby, president of NOM, describes National Nutrition Month as “encouraging people to return to the basics of healthy eating. We are asked to recognize that there is no one right way to eat but that it is important to incorporate an array of healthy foods,” Colby says. NOM introduces children and young adults to new fruits and vegetables they may never have tasted before and sends them home with print-out recipes. “Even if they don’t like it the first time we know that children are more likely to try a food again if they are already familiar with it. So, every exposure counts,” Colby says. Going further than exposure to new foods, NOM also teaches young people about different ways to consume healthy foods. Whether challenges arise to eating healthy foods due to cost impediments, lack of variety in preparation, or even picky eating habits, NOM works with young people to find ways to overcome these barriers and to connect students with helpful information and services in Addison County. 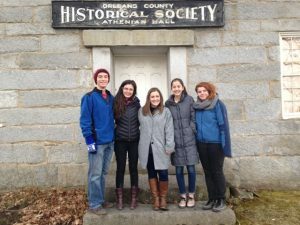 This semester NOM hopes to attend the Vermont Foodbank’s Hunger Action Conference in May and continue their local programming and outreach in schools and beyond. Interested in attending the Vermont Foodbank’s Hunger Conference? Want to learn more about NOM and the chance to join the organization as a volunteer? Visit go/nom, or email Chelsea Colby, ccolby@middlebury.edu. This entry was posted in Midd Blogosphere and tagged News & Events, Student Org Profiles, Uncategorized on March 14, 2016 by Alison Haas.